Funny story, I was musing about a Civilization sequel just yesterday while out for a run, and lo and behold, 2K Games says it's in development as I'm typing this. What's more--and I have to admit, somewhat unexpectedly--it's still being developed for PC. What's Civilization? Surely you jest...but in case you're serious, it's pretty simple: One of the most important turn-based strategy video game in the history of the medium. Also: A pretty spot-on history simulator (in terms of history's broad strokes and ideological angles, anyway). The general goal--to conquer the world by diplomatic or less-than-diplomatic means--hasn't changed much since the original debuted in 1991, but as they say, the journey is all, and that journey's generally improved by leaps and bounds with each installment. Calling Civilization V's new engine "astonishing," 2K says the game has been rebuilt "from the ground-up" with a brand new combat engine, more sophisticated diplomacy, and expansions all around to existing features. The most startling change? Have a seat, Civ wonks: Hexagon tiles. That's right, six sides per board position instead of four. UPDATE: And that's how long it's been since I've played a Civ game. As one of my readers astutely reminds, you could still move or attack in diagonal directions, meaning a move to hexes actually drops the number of possible attack/defend angles from eight to six, and instead streamlines movement and makes visualizing it simpler, since the center of one hex is equidistant from the center of any adjacent other. Yes, hex-based gaming tend to be the purview of un-showered wargamers, but go with it. If anyone can make a hex-based approach fit like a glove, it's probably a guy like Sid Meier, the series founder and Civilization V's design lead. 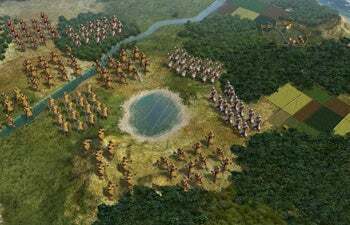 Civilization V takes this definitive strategy game series in new directions with the introduction of hexagon tiles allowing for deeper strategy, more realistic gameplay and stunning organic landscapes for players to explore as they expand their empire. The brand new engine orchestrates a spectacular visual experience that brings players closer to the Civ experience than ever, featuring fully animated leaders interacting with players from a screen-filling diplomatic scene and speaking in their native language for the first time. Wars between empires feel massive as armies dominate the landscape, and combat is more exciting and intense than ever before. The addition of ranged bombardment allows players to fire weapons from behind the front lines, challenging players to develop clever new strategies to guarantee victory on the battlefield. 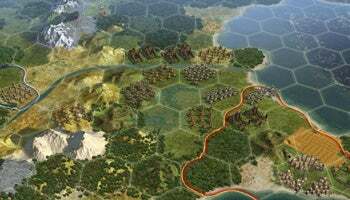 In addition to the new gameplay features debuting in Civilization V, an extensive suite of community, modding and multiplayer elements will also make an appearance. "Sid Meier's Civilization franchise has been recognized as one of the greatest PC game franchises of all time with millions of units sold worldwide," said Christoph Hartmann, president of 2K. "Civilization V takes the franchise further by offering players a more immersive experience with deeper strategies; heightened tactical combat; vast, realistic landscapes to explore, battle over and claim as their own; and an in-game community hub where Civ fans can share content and compete against each other without leaving the game. This marks a new era that will forever change the franchise responsible for sleep deprivation and reduced productivity for nearly two decades." "Each new version of Civilization presents exciting challenges for our team," said Sid Meier, director of creative development at Firaxis Games. "Thankfully, ideas on how to bring new and fun experiences to Civ players never seem to stop flowing. From fully animated leaders and realistic landscapes, new combat tactics, expanded diplomacy and shared mods, we're excited for players to see the new vision our team at Firaxis has brought to the series." It's already February, so we'll see it, what, sometime in late 2011? Early 2012? Or not. How does 'fall 2010' strike you? More at the game's just-launched official site.